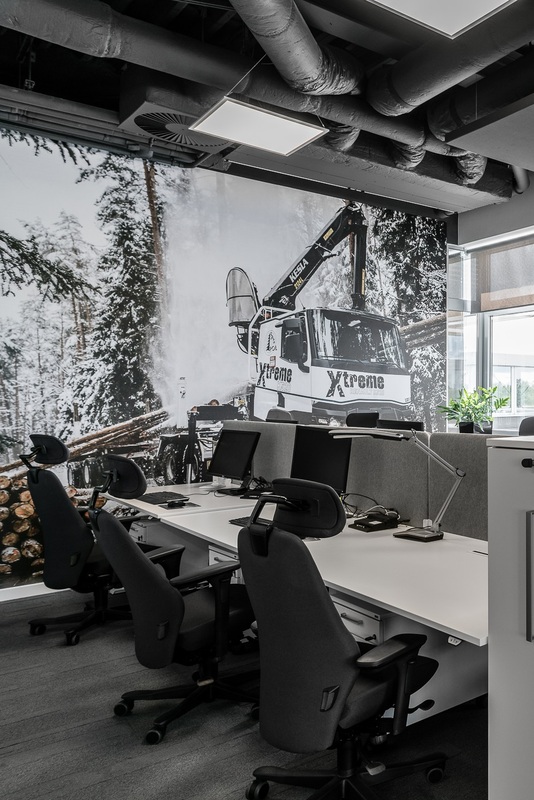 The offices of Volvo Group Trucks Poland situated in Młochów near Warsaw, which has served as the company’s head office for the past 10 years, were finally revitalized in May 2018. The last stage of the renovation works completely revamped the second floor, where the regional management board has its seat. "Our primary goal was to create a modern space designed in line with the latest global office trends. We also wanted to tie in with the Swedish architectural style, so as to evoke the culture and values espoused by our company." Each employee received one of the best models from the Kinnarps range of office chairs – Plus or Capella with an adjustable headrest. The workplaces have also been equipped with sit/stand-type desks with electrical lifts, which enable the employees to work in both a standing and sitting position. The Petals chair resembles the petals of a flower. Its high back climbs upwards, creating a separate place for spontaneous meetings or a brief rest. An open kitchen with a large bar and atmospheric lighting becomes the heart of the office space. The dining room is complemented by chairs and hockers from the Embrace series and Oberon tables. A vivid green and the warmth of natural wood create a cosy atmosphere. The new arrangement contains 60 ergonomic and comfortable workstations. The project had been developed by the architects Izabela Sywia Nowak (author) and Michał Czerwiński, while Kinnarps had once again supplied the furnishings. Their ideas have thoroughly transformed the office and rearranged the space in a much more efficient manner, imbuing the entire décor with charm and purpose, down to the tiniest element. "We wanted very much to bring a consistent pattern and abundant lighting to both the conventional offices and to the open space. We were more than successful, as the result has indeed exceeded our expectations," commented Ślęzak. Volvo Trucks is one of the world’s leading manufacturers of trucks, buses, construction equipment and marine and industrial engines. The Swedish company has always put people first and the remodelled seat is intended to showcase this philosophy – a friendly place of positive energy that contributes to the well-being of its personnel. To this end, the central section of the office had been turned into a multifunction open space. "We were all about infusing the area with a relaxed, informal atmosphere, where everyone would feel at ease, regardless of age or position held at work. Such an approach promotes building good team relations, which translates to better cooperation, understanding of what the company stands for and considerably improves the integration of our community. It was all the more important because here at Volvo we embrace the diversity that brings together generations, inspires and educates,” Monika Ślęzak further noted. At the heart of the area is an open kitchen with a large bar tinged in soft subdued lighting. Around the kitchen there’s an assorted choice of seating, varied in design, which can be used for meetings, work, calls and videoconferences, as well as rest and recuperation. The whole area is suffused in vivid greens and warm shades of natural wood. “Change and transformation for us is a major source of inspiration and energy boost, which is why the solutions suggested by the architect Sylwia Nowak and by Kinnarps have been very well received by our employees. Mostly because these are modern interiors bringing comfort and high spirits to users. The chillout zone is a great place to have in an office, allowing employees to feel at home and freely exchange ideas,” stated Ślęzak. Małgorzata Kulis, Managing Director at Volvo Group Trucks Poland, underlines the importance of work environment as a business tool, useful in team management by promoting diversity, positive atmosphere and company pride, as well as developing a brand that properly conveys the values espoused by the company. „Volvo is an organisation with admirable culture and values! We are committed to environmental stewardship and quality, and we take pride in the fact that for decades Volvo cars have been a byword for road safety. But we must not forget that a brand is built first and foremost by people. Our strength lies in diversity, drive for results and the passion that guides all our work. Our employees bring to the job a mix of experience and youth, tradition and innovation. The organisation’s positive vibe is manifested in our offices, where the Volvo crew feels comfortable and relaxed, able to achieve excellent results. I believe that in order to do well on the market, we must first do well in the workplace – I’m very proud that this is how we do things at Volvo,” insisted Małgorzata Kulis. "We have been working with Volvo for many years, not just in Poland, but in Switzerland, Lithuania and Slovenia. Our design for the office floor in the Młochów headquarters is a fluid combination of nature, modernity and elegance. Straight from the entrance we are drawn to an open space – where green hues meld in with the carved ceiling – and to the ambient bar area. There is a spectrum of lighting temperatures and the colour of the light indicates the purpose of the arrangement, ranging from call pods, small meeting rooms, larger conference rooms, as well as open space which can be boxed off to form isolated sections well-suited for presentations, meetings, or relaxation activities like yoga classes. It was essential for the project to deliver a space that is diversified and appealing to users,” insisted architect Izabela Sylwia Nowak. “I see architecture as a spatial reflection of changes in lifestyle, thought and work. Of critical importance in an office is a careful layout, in order to facilitate cooperation between people and teams. A workplace’s quality has a discernible effect on employee relations, therefore an office venue should above all provide comfort, bolstering well-being and efficiency, so that employees actually want to reside there. Our desire was to create an interior that was timeless and future-proof, as reflected in our choice of materials, colours and shapes. 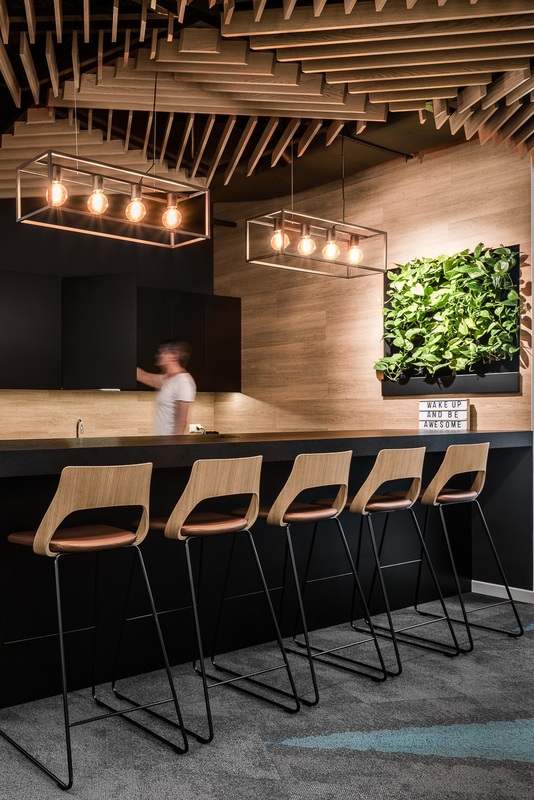 Tranquil, elegant office rooms stand in stark contrast to the inspiring, kaleidoscopic open space, the whole concept seamlessly blending nature, tradition and innovation,” concluded Izabela Sylwia Nowak. 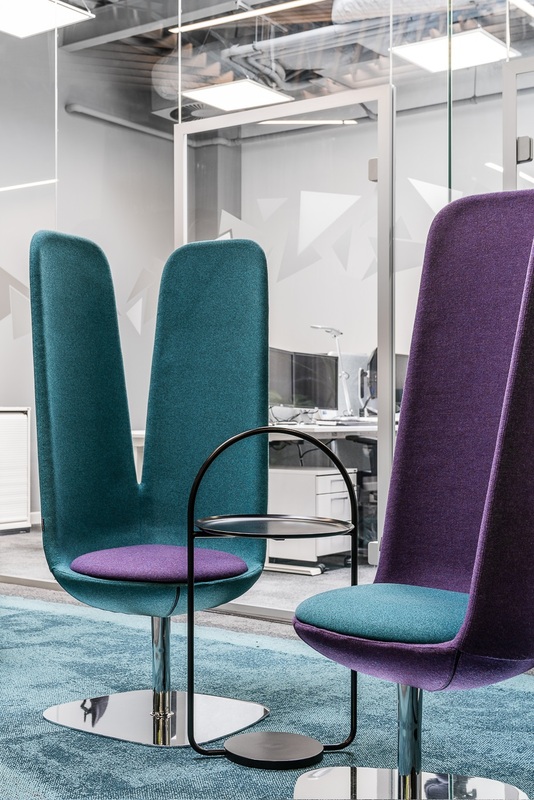 As a leading provider of interior workplace solutions in Europe, Kinnarps has been working with Volvo Group Trucks Poland for many years now and were responsible for delivering a selection of office furnishings and modular acoustics for this project. „As a rule, we choose only reliable business partners offering best in class solutions, tailored to the character of work in our company and at the same time respecting the principles that distinguish businesses with Scandinavian origins. With that in mind, Kinnarps is an ideal partner – not only as a trustworthy, accomplished consultant, but as an upholder of the same values that we hold dear,” said Monika Ślęzak. „Our cooperation with Volvo Group Trucks Poland has gone smoothly as always. We are delighted to have a customer that shows such significant concern for its employees. Workstations have been equipped with electronically height-adjustable sit&stand desks and state-of-the-art task chairs with adjustable headrests (Plus and Capella). We have also run a training course in workplace ergonomics, so that the employees of Volvo Group Trucks Poland can make optimal use of the available solutions,” said Monika Miksa, Key Account Manager at Kinnarps Polska, in charge of the Volvo project. Enjoying this case? Curious what could be done with your space?